The Big Mac, Chalupa, and everything on the Wendy's Super Value Manu may be modern miracles, but humans have been craving fast food munchies for thousands of years. In fact, people have been hitting up fast food joints for snacks since at least ancient Rome, according to archaeologists who just unearthed a 2,000-year-old "fast food" bar in the ruins of Pompei. In the midst of one of the most intensive digs in the ancient Roman city since the 1960s, experts uncovered an exceptionally well-preserved and frescoed fast food counter, where folks would drop by to pick up some hot food or drinks to take away. 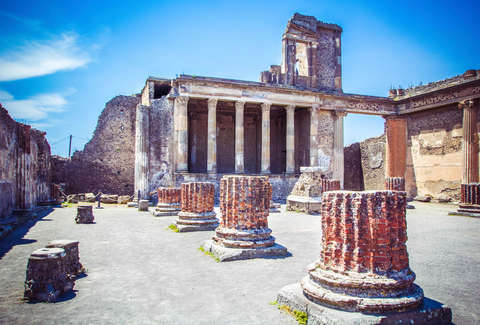 The setup, known as a thermopolium, was actually one of around 150 or so similar snack bars that existed in Pompei, according to a report in The Guardian. They were typically used by poorer residents who didn't have the means to cook at home and menus included the likes of bread with salty fish, baked cheese, lentils, and spicy wine. It's not clear specifically what was being served in this one. The snack bar was found in an area known as Regio V, a 54-acre excavation site that's yet to open to the public. “A thermopolium has been brought back to light, with its beautiful frescoed counter,” captioned the site's superintendent Massimo Ossana, in an Instagram post of it being uncovered. When Pompei was destroyed by the eruption of nearby Mount Vesuvius in 79 AD, it was essentially entombed as-is under ash and lava. And while that must have been horrifying to witness (some 2,000 people died), the silver lining is it has become a stunning artifact of a bustling society. A great deal of the uncovered ruins are open to the public, but much of the sprawling city is still being actively unearthed. According to the Guardian report, in recent months archaeologists have found a fresco depicting Narcissus staring at his own reflection in a pool of water, skeletons of two women and three children huddled in a villa, and even remains of a horse and saddle. To think, one day archaeologists of the future might come across the remains of a combination Pizza Hut and Taco Bell and try to piece together why, exactly, they ever existed.